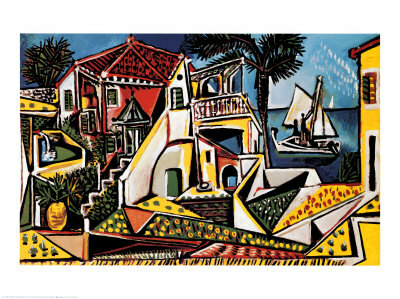 Description: Pablo Picasso (1881 – 1973) was an artistic virtuoso who co–founded Cubism, and produced an astounding 20,000 paintings, prints, drawings and sculptures during his brilliant 70–year career. Picasso‘s unparalleled body of work was so vast, and its phases so unique, that art historians have divided it into specific periods. A child prodigy, Picasso took advanced classes at the Royal Academy of Art in Barcelona when he was only 15. His revolutionary Cubist works, with their distorted shapes and fragmented forms, established art as a genre that does not need to literally represent reality. Zealously embracing every medium from primitive art to sketches to Surrealism, Picasso had an unrivaled influence upon 20th century art. I love a bit of Pablo. He's so abstract and so colourful. I have put him up in my kitchen. I like a bit pablo too.